In multi-storey buildings it would be ideal if each of the column’s longitudinal rebars could be placed as one single piece throughout the structure’s entire height. This however cannot be accomplished for practical reasons therefore, the length of the longitudinal rebars is equal to the height of each storey. When lapping steel bars from successive stories, it is important to ensure the correct transmission of forces from the rebars of the superjacent floor to the rebars of the subjacent floor. This can be achieved by welding, however this method has a number of technical difficulties and it is used only in special occasions. The practice usually followed is the rebar lap-splicing i.e. rebar lapping by means of contact. The length of the placed bars must be extended by an additional length called ‘lap length’, which has to be equal or greater than the length required for the lapping of corresponding rebars between two successive storeys. This length is equal to the rebar’s diameter multiplied by the ‘contact coefficient’ (its value varies from 45 to 60). It is important to thoroughly understand how the lap-splices are being done in practice. One must always keep in mind that in order for the stirrups to provide confinement, every rebar must be placed inside one of their corners. This however is difficult to be done at the beginning and at the end of the lap-splice and it can be achieved only with special practices. In case the rebars are wired together on the site, the lap-splice is mandatory to be done according to the first way shown at the opposite figure. The starter bars of the subjacent storey must be kept straight while the rebars of the above floor must be bent at their joint point. The bent part must extend to one or two stirrups. The use of rebars with diameters greater than Ø20 or Ø25 makes bending in situ extremely difficult if not practically impossible, that is why the rebars have to be bent prior to their placement with the use of a bending machine. The ‘contact coefficient’ is proportional to the steel’s yielding strength and inversely proportional to the concrete’s compressive strength [*] NoteFor B500 steel and C30/37 concrete, the ‘contact coefficient’ is a= 54 > starter bar length lo = 54*20 = 1080 mm. The following table shows the necessary lap lengths in mm, for three different rebar diameters in combination with three different concrete grades. The bent rebars can be placed in contact with the straight ones in any direction as shown at the following figures. In case there are no seismic design requirements and for serviceability reasons, it is preferred to place more bars with smaller diameter around the perimeter instead of fewer bars with larger diameter. When seismic design is required, as it is for the columns referred in this book, it is preferred to place rebars only inside the corners of the stirrups thus ensuring that no buckling will occur. Therefore, it is better to use fewer bars with larger diameter. Moreover, structures designed to withstand the seismic hazard, have a considerable amount of steel reinforcement in their joint areas so the small number of column rebars enables the proper reinforcement. 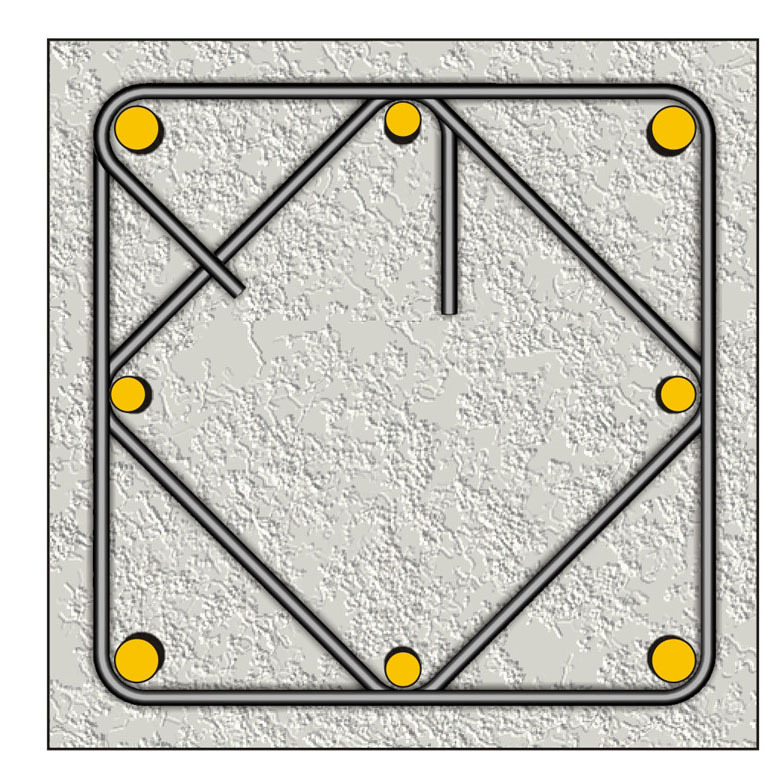 In a square 400x400 section with the stirrups placed in a rhombic layout (having 4+4 corners), 3000 mm2 total area of required reinforcing steel and use of longitudinal rebars up to Ø20, the usual reinforcement is 4Ø20+12Ø14 [*] NoteFrom table 1 derives that 4Ø20+12Ø14 correspond to 4*314.2+12*153.9=1257+1847=3104 mm². . If using longitudinal rebars up to Ø25 the ideal choice is 4Ø25+4Ø20 [*] NoteFrom the same table derives that 4Ø25+4Ø20 correspond to 4*490.9+4*314.2=1964+1257=3221 mm² . (a) Use of high-strength concrete mixture, so as to lessen the required lap lengths. (b) Mandatory use of bending machine for the bending of the longitudinal rebars (in the lap-splice areas) and of course, an accurate detailing with the exact rebar dimensions. 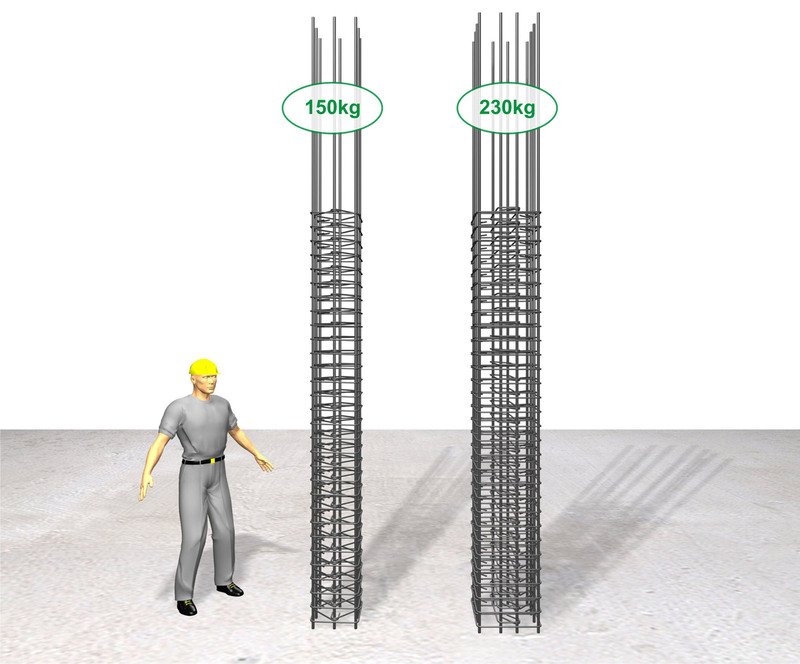 (c) Use of crane as a single Ø25 rebar with 4.65 m length weights around 18 Kg. The first condition regards the concrete industry while the second and third regard the formation and placement of the reinforcing steel. The latter two conditions are discussed further below. (a) It can be easily produced by most cement industries. (b) Although it has a relatively higher cost compared to the regular concrete mixtures, their use allows for a smaller amount of reinforcing steel. (c) It has a low porosity because of the high cementius content thus ensuring a longer struc-tural frame’s service life. This is crucial in cases where the buildings are in adverse envi-ronment such as being at a distance<1 Km from the sea. Most countries of Europe with an advanced construction industry have been using concrete strength classes higher than C25/30 even if they have little or no seismic activity. In a highly seismically active country such as Greece, the usage of high concrete strength classes is not only more economical but technically mandatory. The construction industrialization together with the development of the reinforcement implemen-tation, is contributing to the growing use of prefabricated stirrup cages and also to the use of prefabricated columns that are positioned with the use of a crane. The prefabricated reinforcement and its mechanical implementation are two simultane-ously developing techniques. Earthquake resistant columns have a large mass. For instance, the smallest allowable column mentioned before (stirrups and longitudinal reinforcement), has a mass equal to 60 kg as op-posed to the usual antiseismic columns whose mass is much greater. 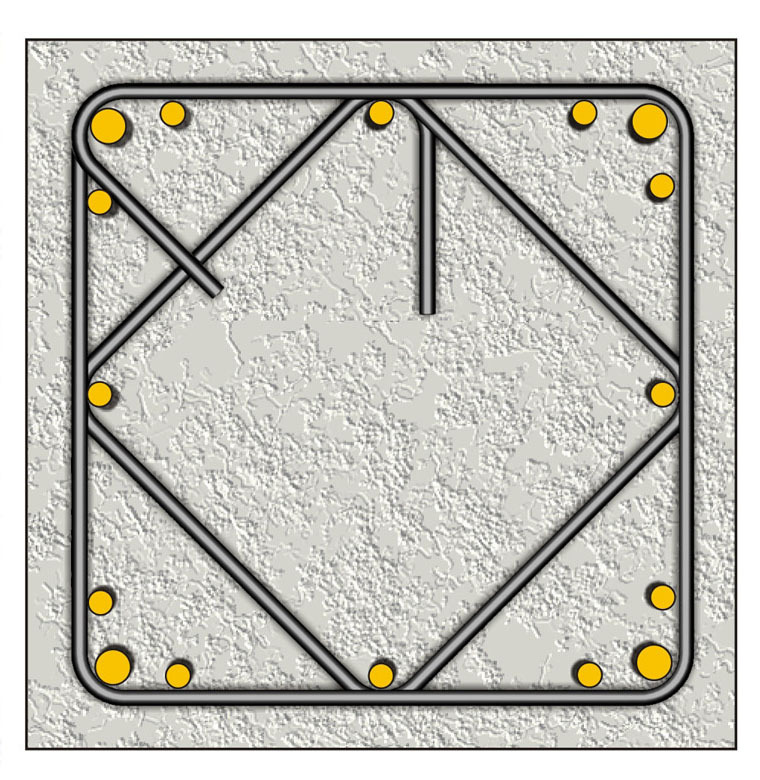 A common 400/400 col-umn with Ø10/100 stirrups placed in a rhombic layout and 8Ø20 longitudinal reinforcement, weights 150 kg and the also usual 500/500 column, with stirrups placed in a cross layout and 12Ø20 longitudinal reinforcement, weights 230 kg.